We possess over 12 years experience in this field and can provide one of the highest levels of quality customer services and care. 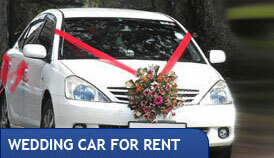 We are capable of providing any type of vehicle to suite your immediate needs. safe and comfortable ride something which we have never failed in offering to our customers. Home 4 WD SUV's-FULL SIZE LUXURY CARS Sitemap Address : No :81/35, Kadawatha Road, Kalubowila, Dehiwala.